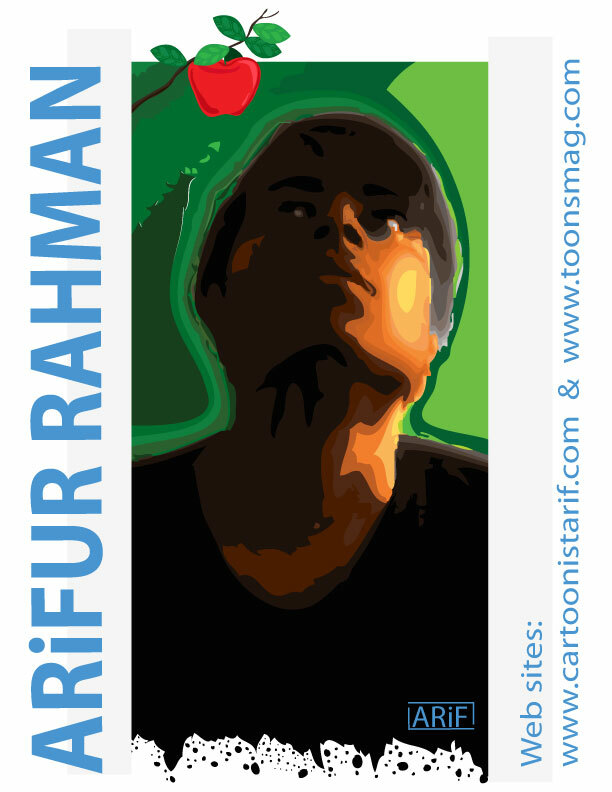 Welcome to my world, I’m ARiFUR RAHMAN but most of the people call me CartOOnist ARiF. As a human I feel proud to say that I am a cartoonist. I never give up hope, I always TRY to do something best. TRY is my philosophy. So, I always said to my friends, don’t give up hope. TRY with confidence, you will be successful. I have drawn lots of cartoons for newspapers, TV and for web. I have drawn various cartoons character for various animations and experimental works. I’m trying to make animation from 2000, but successful I can make it in 2008. I make two animations (A flower and Sky Crash), it was my experimental animation. Now I am trying to make new a animations. I also design some posters for Bangladesh election commission in 2008. It was about election commission’s law on national election time. They hang this poster every where of Bangladesh and they make advertisement for TV using my cartoons. I can draw various kind of cartoon character, some cartoon character are very famous, as BIBEK, LATHI, TREE, BOLTU, HABU, BABU, OLD MAN and lots of. I have draw for lots of experimental animation and lots of animation for TV channel. I have draw 185 BIBEK episodes, Drawings and lots of experimental drawings. I can write so most of my cartoons idea is mine. I can write story, drama and story for comic. In 2010 KOLPO produce a short film it’s name ROKE, it duration was 30 minutes. ROKE was base my story. I also worked with a film maker as an assistance film director; it was very short time work experience. I could not continue work with them because of some reason. But I’m personally directed on an animated short film. Its names TRY. It’s duration about 5 minuets. I can draw in adobe illustrator and in Photoshop. I illustrate book from 2008, I illustrate average 20 books in 2008-2010. Some was book cover and some was illustration inside of books. I have some comic story, and some comic character. And I’m also trying to make a comic book. My one of the comic is BOLTU. It was published in newspaper. I’m also a painter. I start painting from 1993. It was childhood paintings. Day by day I try to develop my paintings. From 2004 I consultant on drawing cartoons and I leave drawing paintings but now I re-start drawing paintings again with cartoons. I’m the funding developer of tOOns MaG. tOOns MaG is the first online cartoon magazine from Bangladesh and a community for creative peoples. And I also develop another some web sites of some organizations. Some times I also write poems, but I am not professional poet. I write poems from my 1995. But it is irregular. My poem is my very personal sometimes I just express my feelings or moods on my poems. Sometimes I published on my blog. I join on BIBORTON NATTO GOSTHI drama team on 1998. It was a local drama team. I work with them from1998 to 2006. Within 8 years I performed on some drama on stage. In 2002 I wish I will sing, I bought a gutter and I try to practice to sing. I performed some local program with my gutter. And I participate on a singing contest on our town and I got 3rd prize for my song. This song was about our country and our freedom. Lyric and music was mine. 2006: Transparency International Bangladesh anti-corruption cartoon contest 3rd prize. 2008: Transparency International Bangladesh anti-corruption cartoon contest special mention award. Great site! Keep it up! And good luck to you! ARiF You Are All The Best. Hey! I awarded You and a bunch of bloggers an award a few days ago! Check it out! Cartoonists Association CRN from Romania invite you to have a PERSONAL exhibition in Romania. Pour this you must send cartoons at resolution 300 dpi, size 21×30 cm or more, the best quality. If it’s possible, make the caricature of some Romanian personalities. Thank you Brother for your good news. sure i will join with you. Hello sir.. i saw ur work and am very inspired . I want to be a cartoonist too . Please help me with some guidelines .